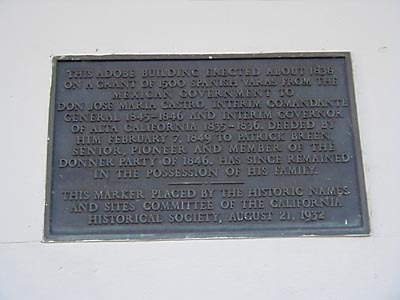 This adobe building erected about 1838 on a grant of 1500 Spanish varas from the Mexican government to Don Jose Maria Castro, interim Commandante General 1845-1846 and interim Governor of Alta California 1835-1836. Deeded by him February 7, 1849 to Patrick Breen, Senion, pioneer and member of the Donner Party of 1846. Has since remained in the possession of his family. 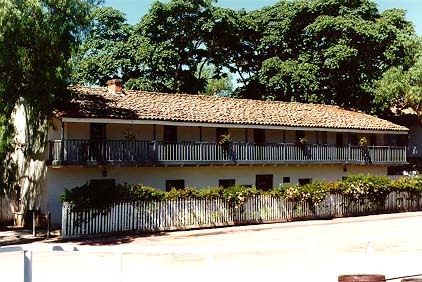 San Juan Bautista SHP, 2nd and Washington Sts, San Juan Bautista. Return to other landmarks in San Benito county.